From the series Kaiju Manga ( Pictures of Magical Animals), #7, Woodpecker Venus, printed in an edition of 30. Paper size 21.5 x 29.5 cm. ; image size 18 x 25 cm. 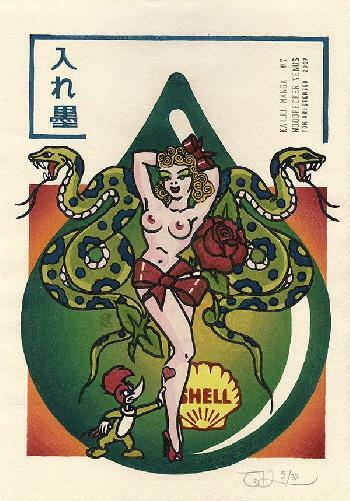 This is a variant of Kaiju Manga #6, Snakeoil Tattoo. Only an A.P. remaining. Printed on Shioji kozo washi. “The woodpecker spends a lifetime tapping and chiselling into trees, chasing for food under the bark and making cavities big enough to nest inside. The busy little bird is found throughout the world and there are more than 180 different species. The head of the woodpecker is highly adapted to the incessant impact of hammering into timber. Apart from a pointed beak and a super-long tongue, the woodpecker has a thick skull and a relatively small brain. It is able to absorb the shock of each blow by momentarily clenching its mandibular muscles. Japan has its own woodpeckers with three endemic subspecies of Picus awokera, known as kitsutsuki. In 1930 a group of sôsaku hanga artists began publishing a magazine of woodblock art under the Kitsutsuki banner. The woodpecker was again used as a mascot for woodblock artists when Un’ichi Hiratsuka formed Kitsutsuki-kai, the Woodpecker Society, and in 1942 the group began publishing Kitsutsuki hangash?, the Woodpecker print collection.